this week's party. Please bring your outdoor images and join in. 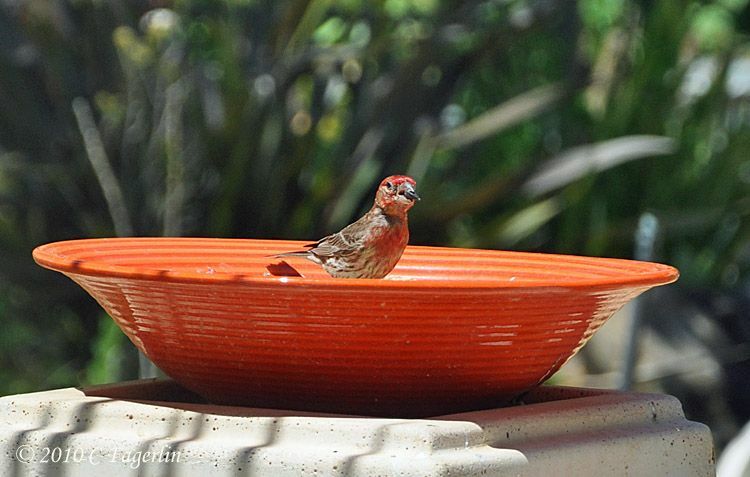 that it wasn't going to be enough to feed the whole flock of finches that live in my garden. So they now have a new feeding station that is gravity fed from the plastic container on the top. a lot of bickering and complaining from the whole flock. And the newly expanded feeding station! All of today's images were taken on Monday through the kitchen windows. 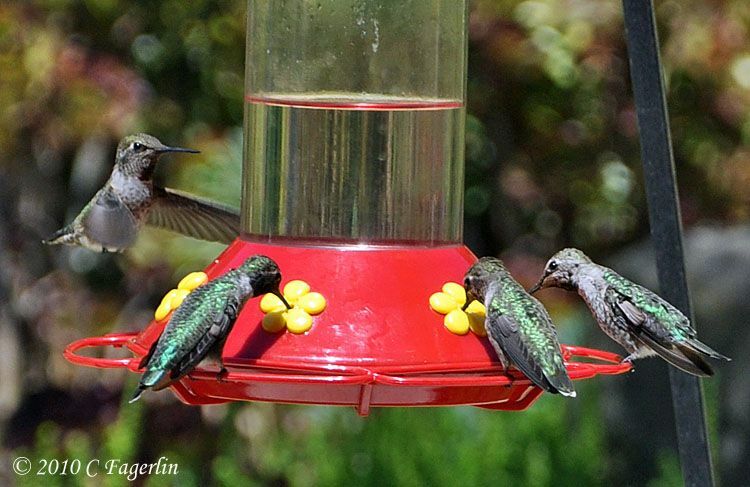 The 3 dozen or so hummers that live in the garden keep me busy making sure they have enough to eat and will screech and cry if their feeders are empty. 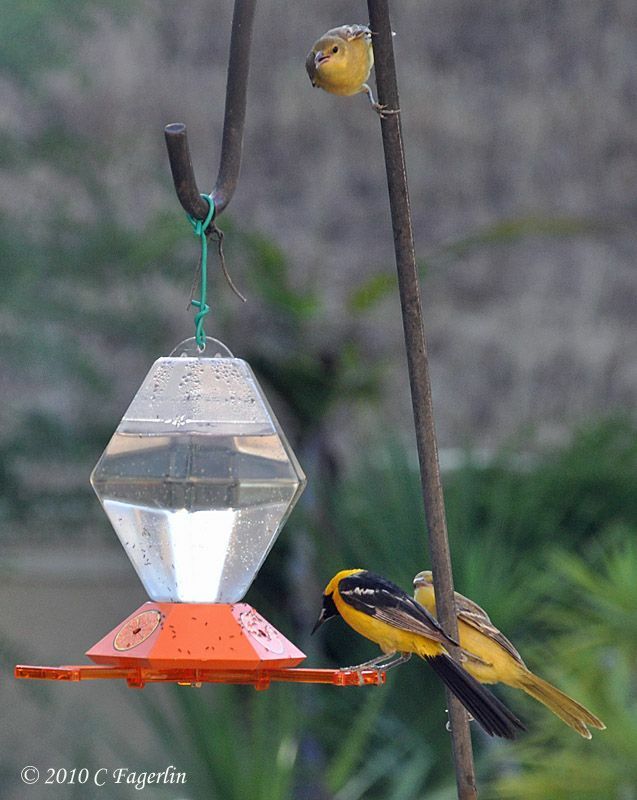 They go through a minimum of 2 quarts of their sugar water per day and are a constant source of amusement with their aerial acrobatics. 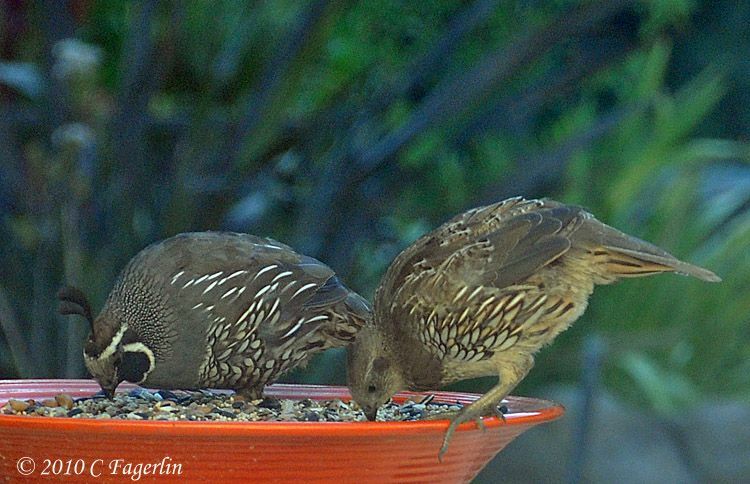 The quail still visit the garden, but have mainly stayed outside the garden wall since Spring, while raising their broods of chicks. Now that most of the chicks are getting bigger they sometimes bring the whole family to the garden late in the afternoon. 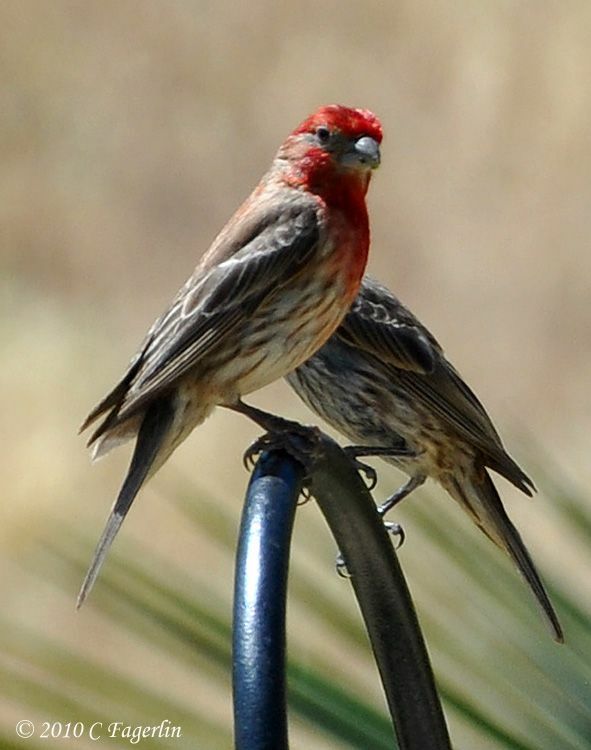 On this particular evening only Mom and Pop appeared at the feeder. 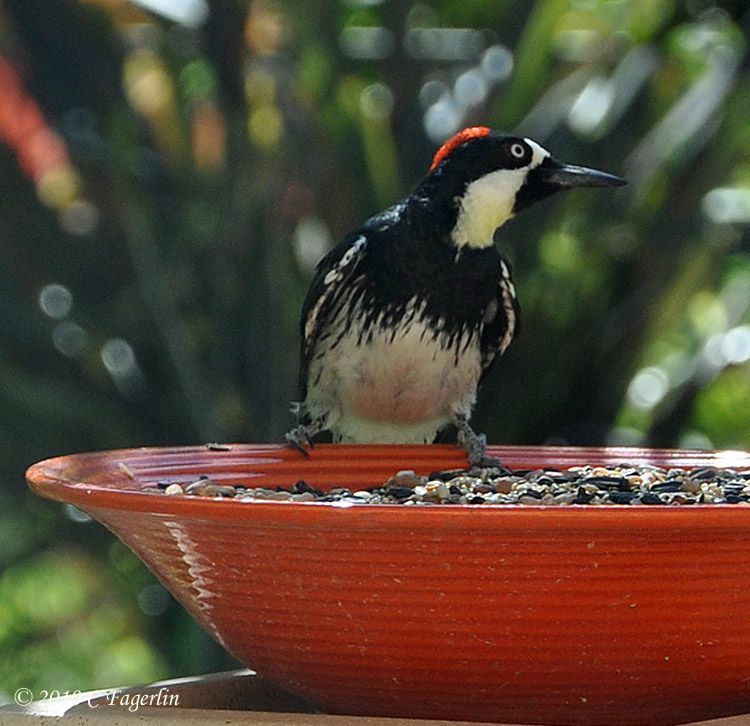 The Acorn Woodpecker flock that lives in the oak trees at the back of our property have become regular visitors to the garden, feeding on many of the blooming succulents in the garden, but they also take full advantage of the seed bowl. 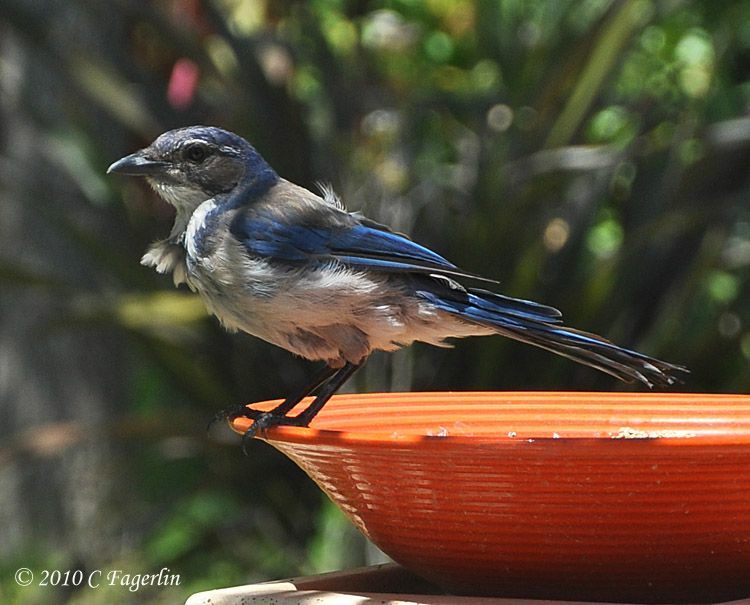 They are always on the lookout for the garden bullies .... the Scrub Jays, who think they own the garden and all its contents. 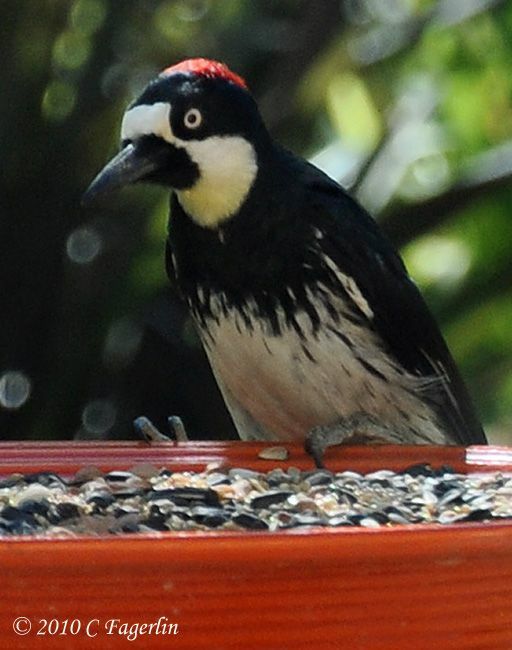 Above is a female with the black stripe between her white face and red topknot. 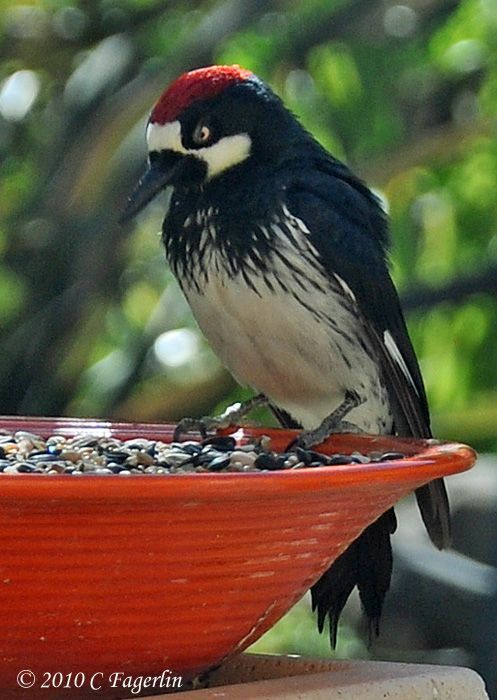 And a male who has a white forehead with no black stripe between it and the red topknot. the care and feeding of the chicks. And she lets out an ear piercing alarm call as one of the bullies arrives on the scene. She gives the bully a piece of her mind and then gives way. It was very windy yesterday, blowing Mr. Blue's feathers all askew. members of the bird population move off. 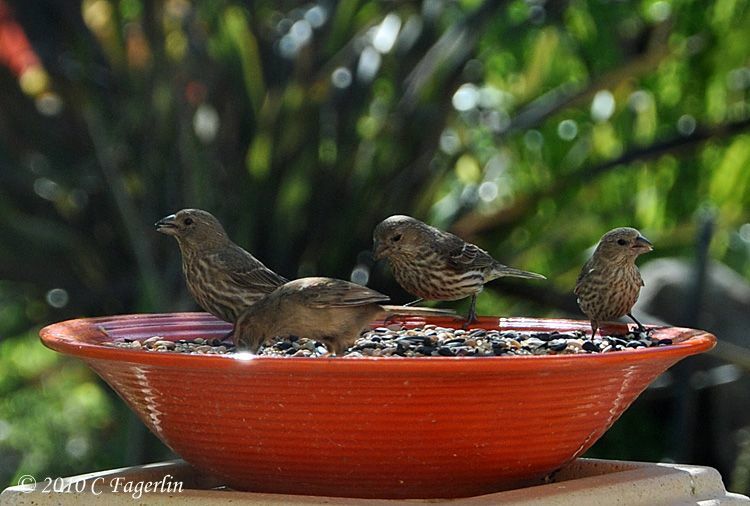 but they generally stick to the seed bowl. lately, they have been coming closer and closer to this easy source of food. are too narrow for their big feet and they spend all their time trying to balance. Pecking on the glass didn't seem to bring about the desired result. OK, now I've got the balance part of it down, but still can't get a drink! 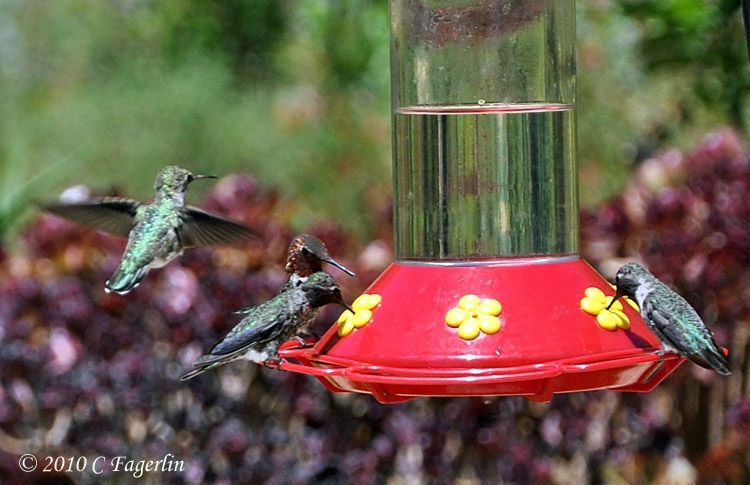 And the hummers were not pleased with the intrusion. 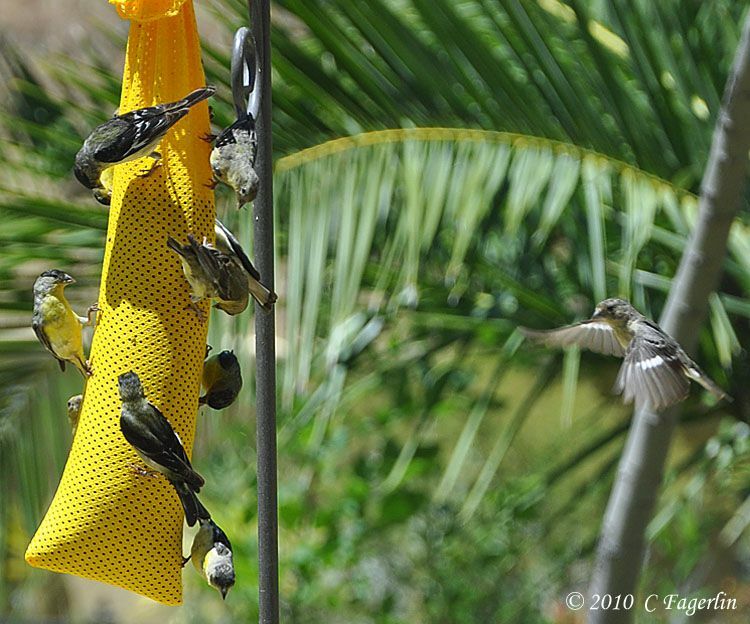 So yet another feeder was added to the garden, but the problems began almost instantly. This poor male is being berated by not one, but two females about the ant problem. The ants were biting his feet and she just never shut up! and the poor guy finally got his drink! 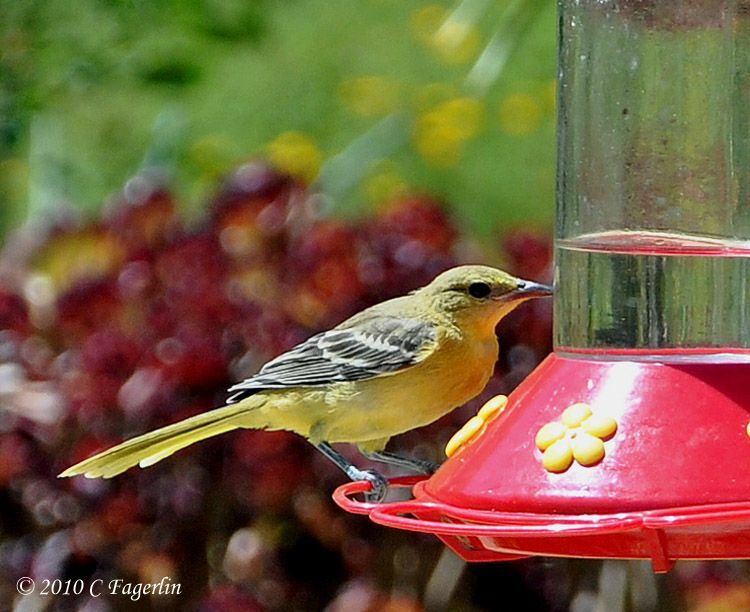 This post is "for the birds" and for all the enjoyment they provide each and every day. Thanks for coming by again for a visit to my garden and Happy Outdoor Wednesday! 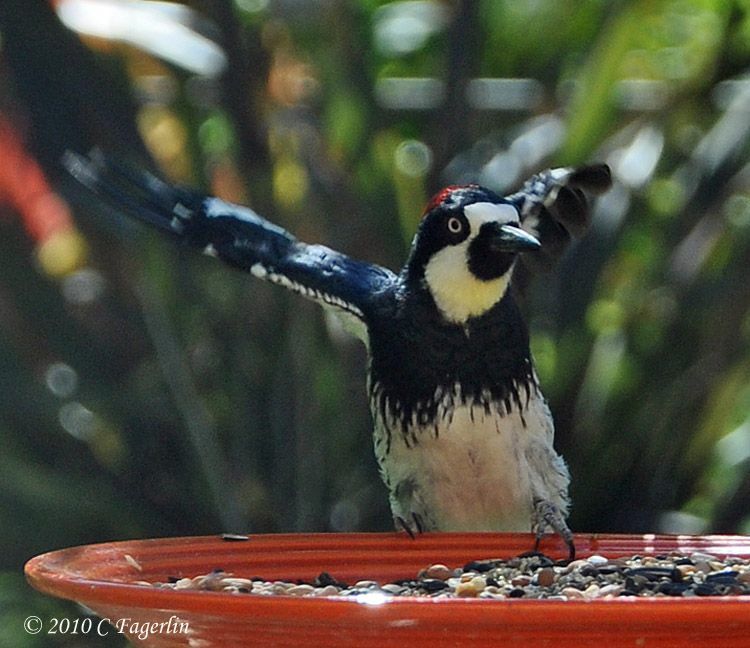 Fabulous photos, what great fun to watch all those lovely birds!!! 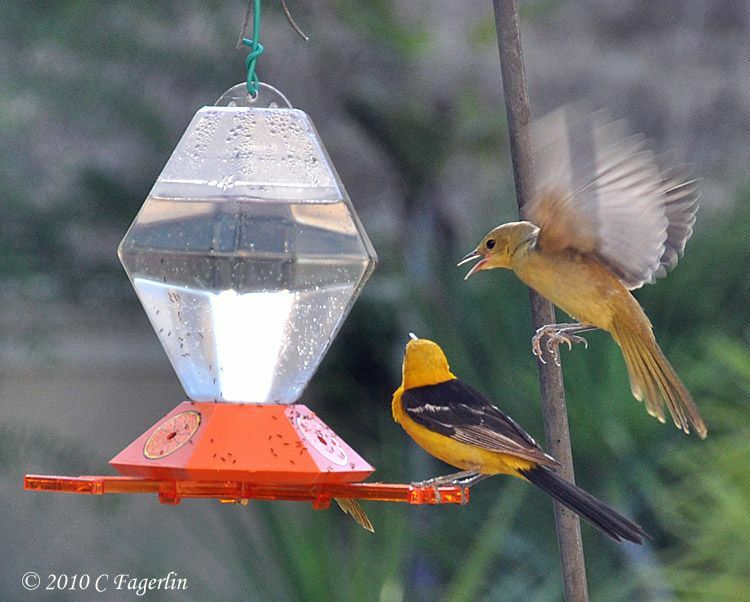 What great photos of the wildlife. I just love quail. 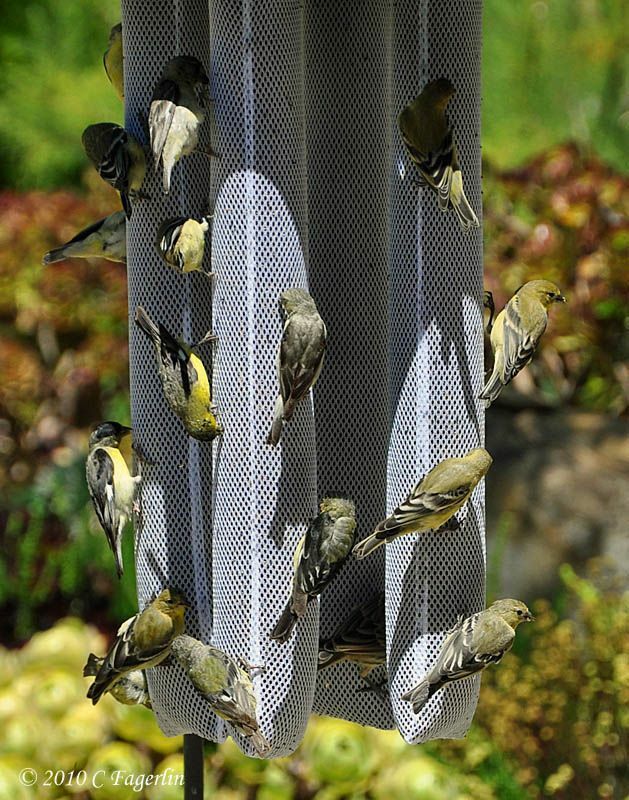 I have never seen them at a feeder. Neat! So jealous of all your birds. 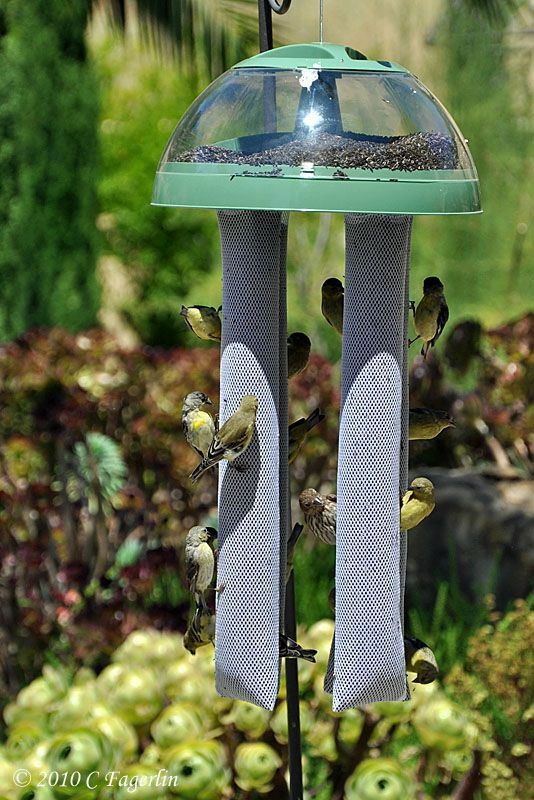 I have a sock feeder for the finches and a humming bird feeder out but no birds. I keep trying but I think my neighbor is hoarding them all. Love the pic of the oriel. 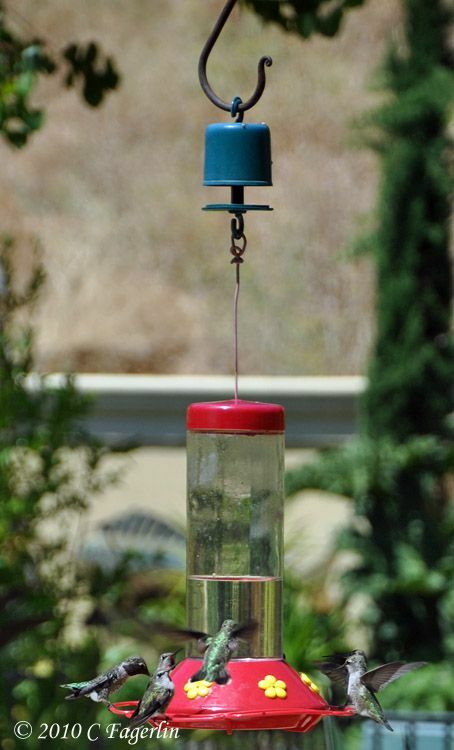 I just love feeding the hummingbirds! They're so much fun to watch. I wish I had as many as you do. 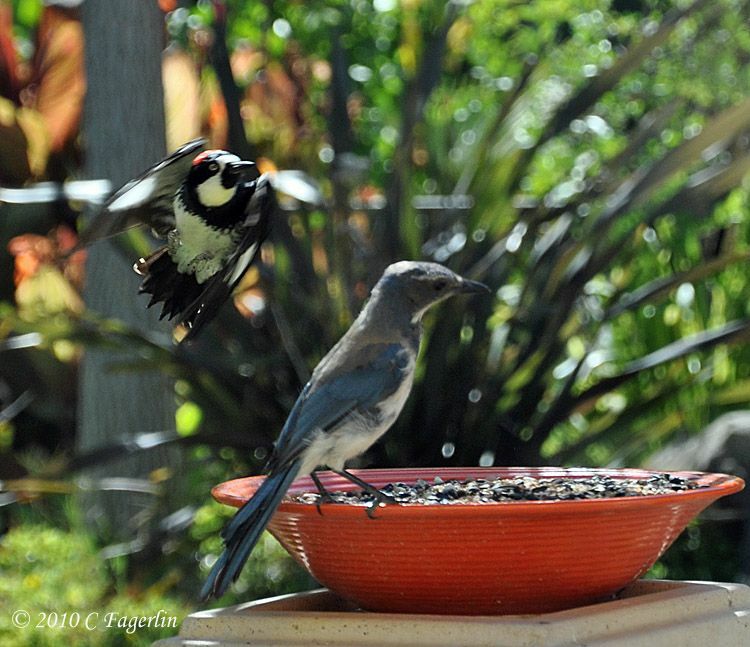 Wonderful bird photos, Candy! It's great to see the fine feathered creatures on the other side of the country! What a glorious post. My mother would have loved this post. She is gone now for nearly 20 years, but she loved birds, feeding, watching, painting, and collecting ceramic birds. 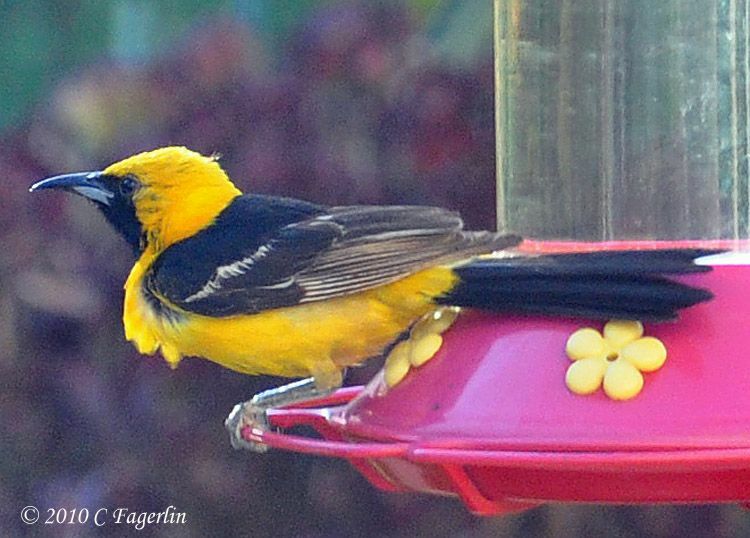 This is the most fabulous collection of photos of birds I have seen. Your music really added to. Nice to catch up with you on Outdoor Wed. 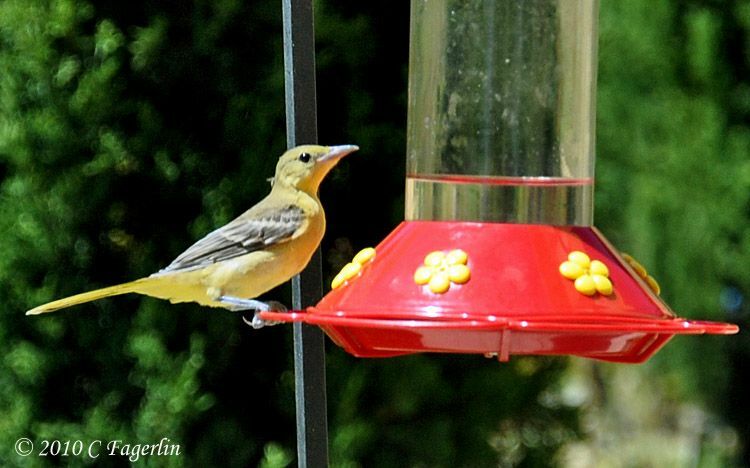 I enjoyed this post so much...I've not seen or read about that particular Woodpecker...and the Orioles are so pretty...The finch feeding station is unique...I put a little oil on the string that the Hummingbird feeder hangs from, that keeps the ants away. Oh I love all the bird pictures. I have so many birds too but they won't sit still for a photo. 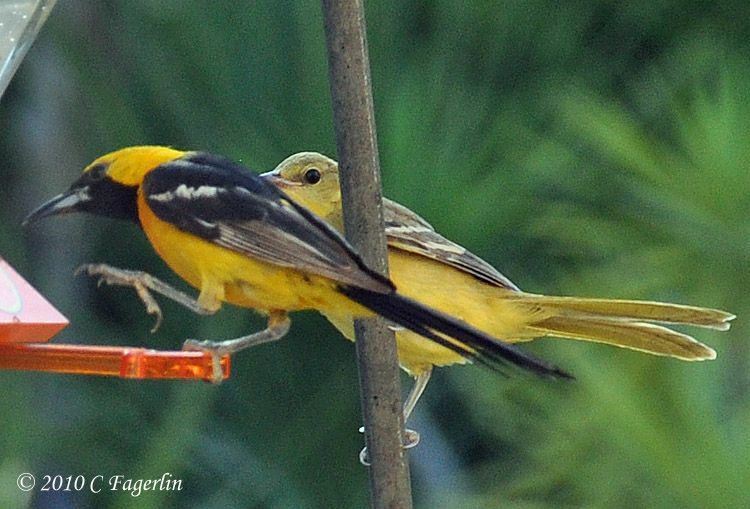 I recently bought a n oriole feeder just for them. It also has a place for grape jelly, which they love and a 1/2 an orange. I bought these really cute ant guards. They are little metal umbrellas that are upside down and you fill them with water. They seem to work....good luck with your ants! Very impressive, do you know what guests eat from the sock, and what eats form the bowl. I throw my bread, rice noodles to the bird on the ground. they eat them these way. Once I hang a bun on the tree, they didn't like this "High class" dining. 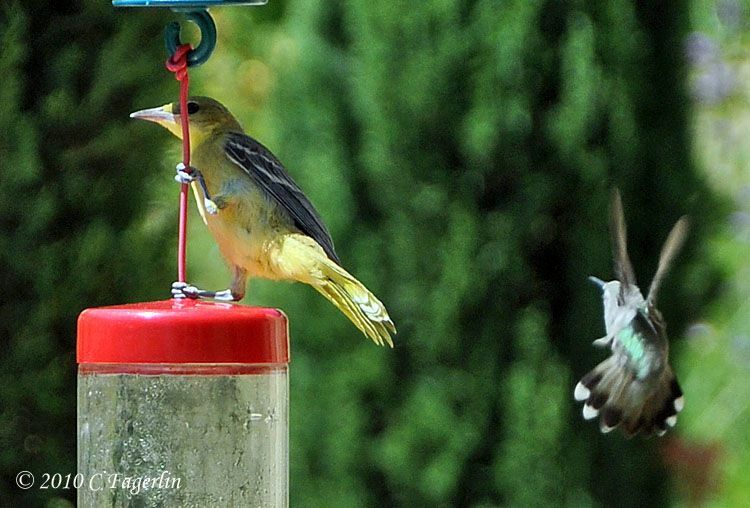 These are amazing bird photographs. Thank you all for coming by to see "my" birds .... I figure if I'm providing their food they belong to me! 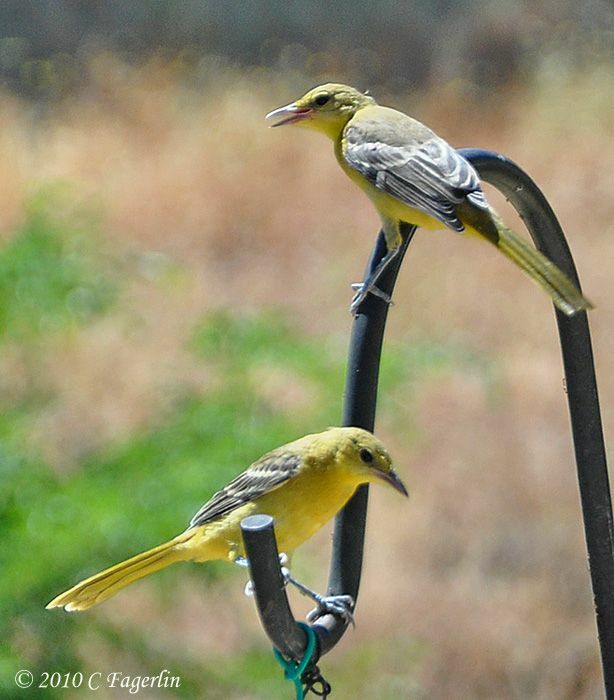 We have had some new visitors in the garden in the last couple of days, a pair of Black Headed Grosbeaks .... still trying to capture them with the camera. 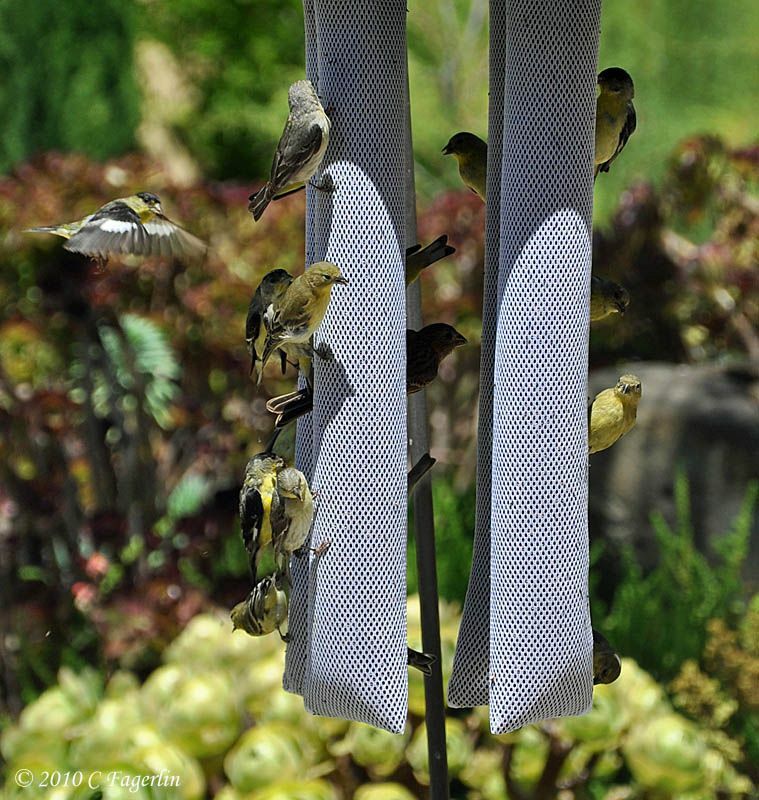 Ann - Mostly all the various kinds of finches eat from the socks, but the gold finches eat only from the socks, while the other types of finches most feed in the bowl. 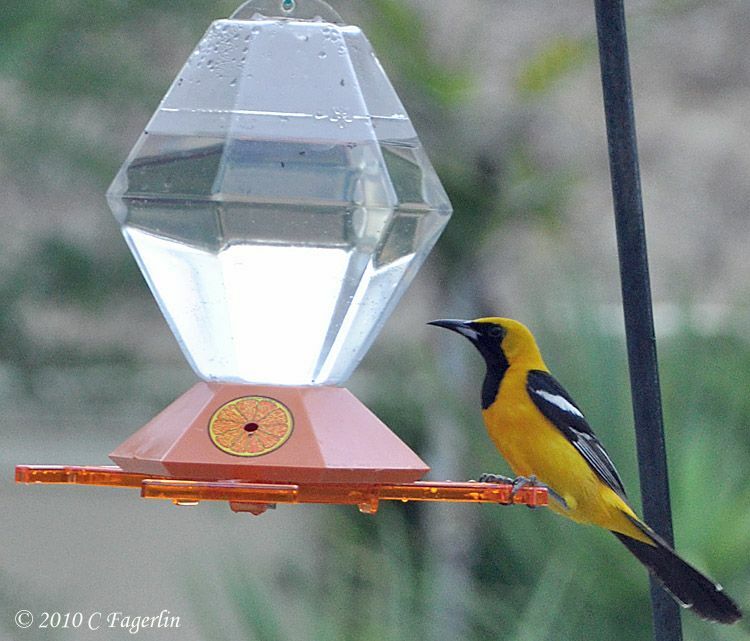 Only the hummers and the orioles drink the sugar water. 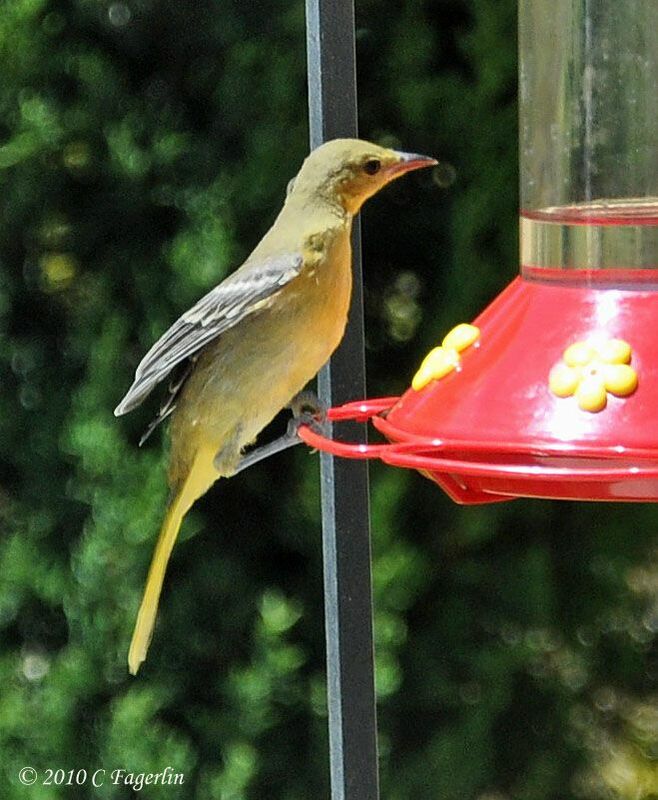 I use a mix of regular bird seed and then add a couple of bags of the "good" stuff ..... with nuts and fruits and more exotic seeds. So pretty much everyone else eats from the bowl. Hopefully more birds by next week! Thanks for coming by Vintagesouthernlife! Try emptying out the feeder and starting with fresh syrup, sometimes that helps.